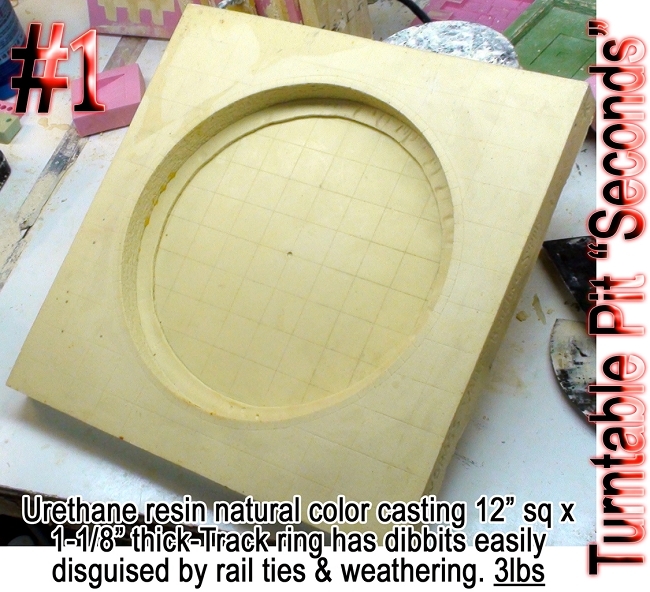 Kit includes Supplement to build Turntable for both Standard & Narrow Gauge for use in the below Color-Cast Turntable Pit. 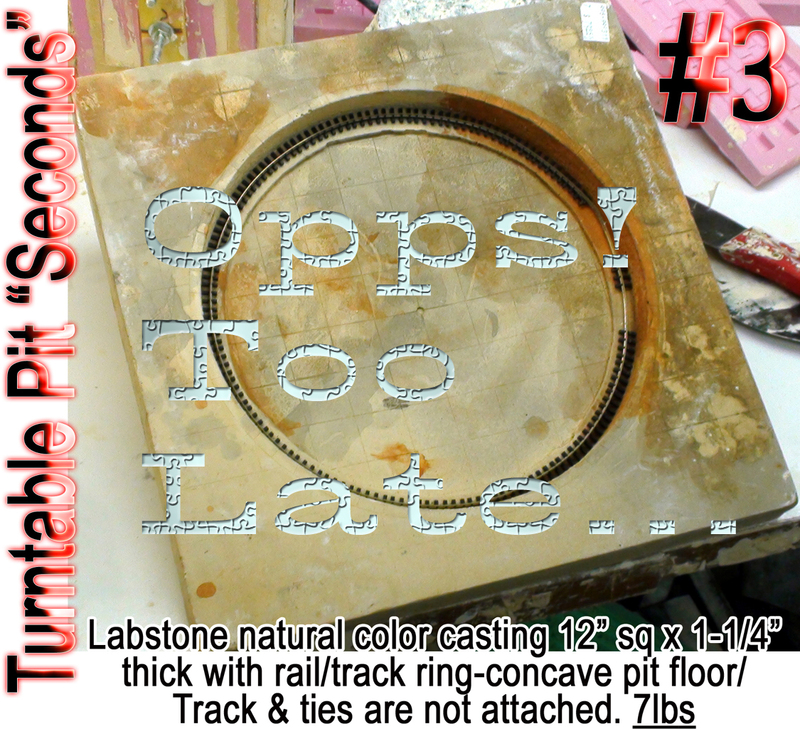 Over time we have assimilated some orphan Turntable Pits--some with issues & others not. Individual images & descriptions are in the below table. PLEASE ASK Questions before making a purchase and incurring the expense of having the Pit mailed to you and you not receiving what you were expecting. Each of the six Pits are "one-of-a-kind" and cannot be replicated. Buy two or three or four and we may be able to do you a break on price. Thanks again for your business! CLICK Photo for larger image! #3 This pit was an experiment to create a Pit floor with a "slump" in it. Did several of these for customers which do look good and accommodates a taller table. #4This pit is cast without a Pit floor because some folks wanted to create their own floor-yes, some wanted wood & others wanted brick. #5 This pit is cast without a Pit floor because some folks wanted to create their own floor-yes, some wanted wood & others wanted brick. 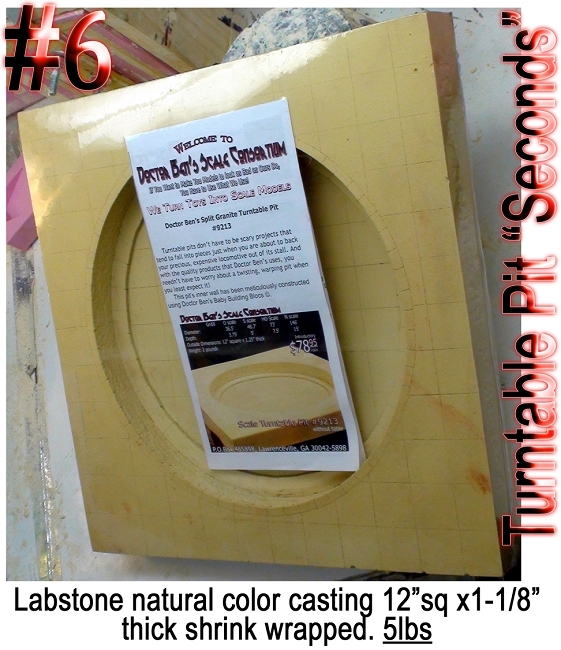 #6 An Original Doctor Ben's Turntable Pits were Labstone natural color casting still in its shrink wrap. 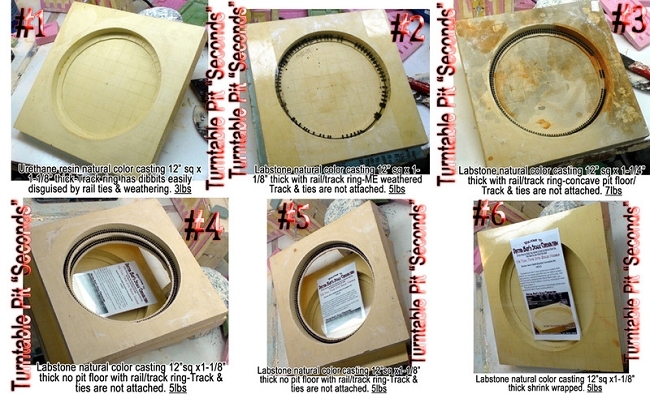 Turntable pits don't have to be scary projects that tend to fall into pieces just when you are about to back your precious, expensive locomotive out of its stall. And with the quality products that Doctor Ben's uses, you needn't have to worry about a twisting, warping pit when you least expect it! 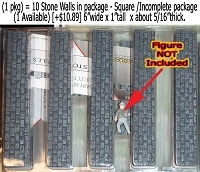 This pit's inner wall has been meticulously constructed using Doctor Ben's Baby Building Blocs. 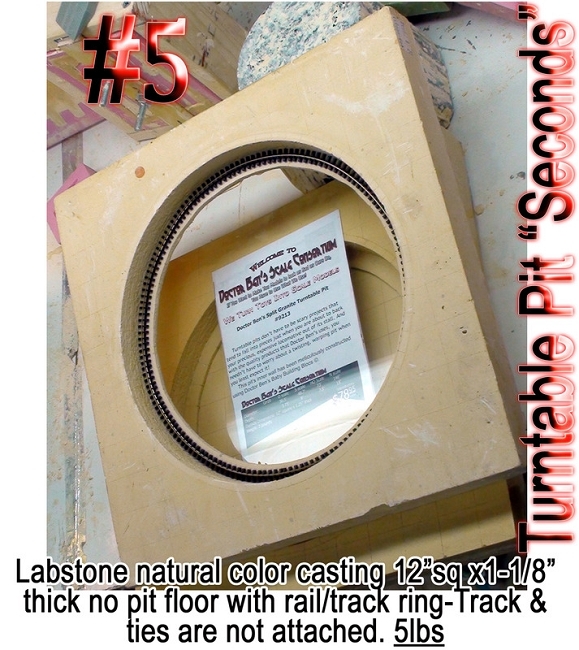 This Doctor Ben's Fine Scale Turntable Pit is fairly simple to install. 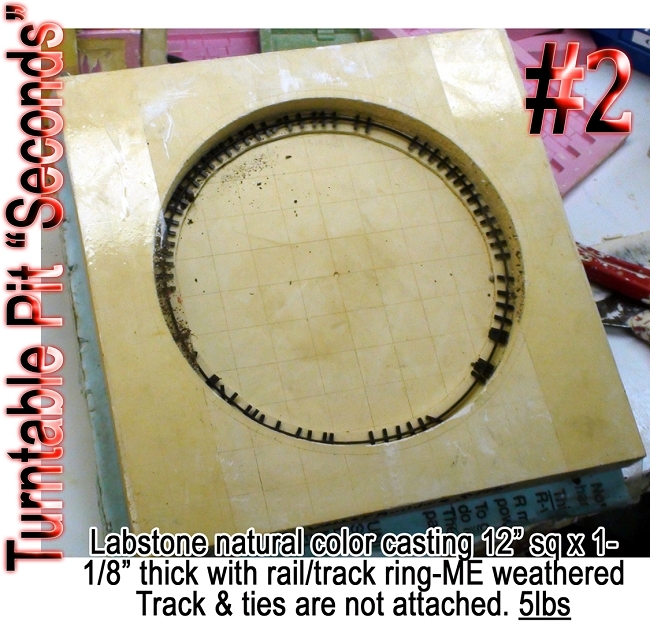 Cut a 12' square hole where you would like the pit positioned in your layout; build up some framing; test the fit of the pit and get all the wiring ready to hook up. Begin priming and weathering as per the Doctor Ben's 'How-To #1: Turning Toys into Models' booklet. 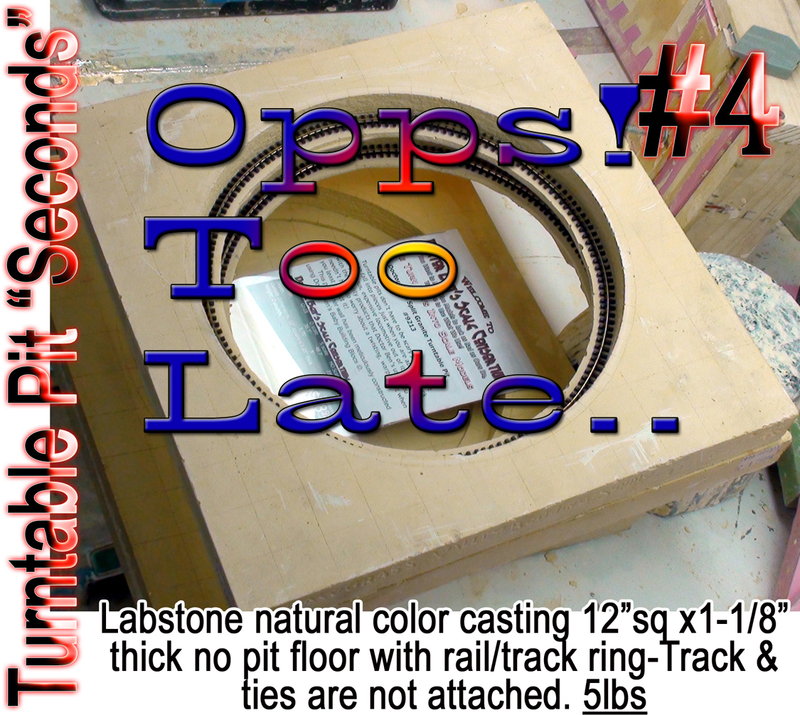 Install circular piece of track (a two-gallon bucket will help you curve the metal track) and test fit (a few strategically placed pilot holes with track nails as locating pins aids this process well) and cement into place with some 5-minute epoxy. Weathering will hide any epoxy that seeps out. 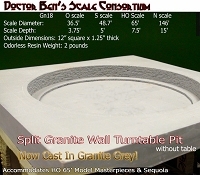 The dimensions of this Turntable Pit are 12" square overall with the pit dimensions of 9.125" diameter by 15/16" to the floor of the pit. The rail lip that you see in the image is 0.093" high by about 5/16" wide. the individual 3/32" BBBs are staggered as not to overlap joints.